Ganesh chaturti is undoubtedly one of the grandest occasions and festivals celebrated in Maharashtra. The Hindu festival requires decoration of houses, prayers, and decoration of idols in their home and is also celebrated as a society event. It is celebrated to honour the elephant headed god, Ganesha. The Ganesh Chaturti festival is one which can be celebrated at home and also as a public event. It includes a long month of hard work by collecting funds in order to purchase and organise the grand public ganesh pooja. The festival brings a sense of joy amongst the people, as the entire community, friends and family gather and join in the auspicious celebration. They essentially pray to Lord Ganesha to receive his blessings for the good health and well being of their family. The women receive help of children to make the sweets and to decorate houses. The festival is celebrated for five days at the end of which, the idol is immersed in a large water body. 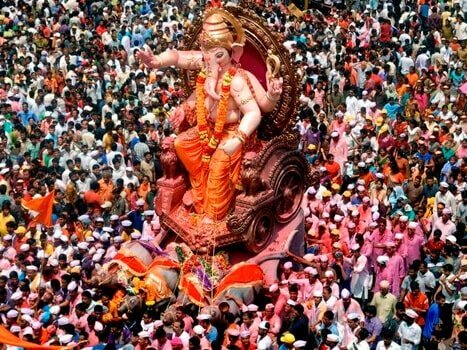 The festival originated during the reign of the Maratha ruler, Chhatrapati Shivaji and spread in the community of Peshwas who considered Lord Ganesha as their Family God. When the Marathas lost power, the Ganesh Chaturti lost its importance until Bhausaheb Laxman Javale visited the Maratha Ruled city of Gwalior and started the festival as a community event. The festival celebrates the birth of Lord Ganesha who is the son of lord Shiva and Goddess Parvati. The festival is celebrated for ten days, once a year, between the months of August and September. The pandals and the platforms, on which the idol of Ganesha must be kept, are built 15 to 29 days prior to the day of the festival. The first day of the ganesh chaturti involves the purchasing of the idol and all the decorations. The idol in installed on a grandly decorated platform of flowers. Jaggery, coconut, durva grass, modaks, and red hibiscus flowers are also offered to the idol. After this, the idol of Lord Ganesha is decorated with ornaments, flowers and tilaks of turmeric and kumkum. The main pooja of the lord includes mantras and hymns written in the Vedas and the holy texts. This pooja and aarti must be held every morning for the next ten days. On these days, the families sing and dance and many cultural events are held in the communities. Special sweet such as modaks and other vegetarian traditional dishes are served to the family as well as the idol. The food can only be consumed after the prayer and offerings are made to the god.